I want a recliner, or you’ll be traveling to the moon! When we last left our befuddled duo, it was a dark and stormy night outside their small cape on the rugged but beautiful coast of Maine. A time warp to the present finds our clueless couple cohabitating in their cute little rolling plastic box as they prepare for a disorienting detour on the rocky road of life while the gentle Pacific Ocean breeze rustles the rusting remains of their retired souls and visions of camper nirvana dance about their aging brain cells to the tune of the Neil Young song, “Old Man”. But alas, the new Silverado stallion requires tack fit for the finery it’s about to be flitting about. So off to the farrier to craft the aforementioned finely fit firmament our clueless couple trots where they select the finest tack known to man, woman, or beast which is kinda redundant doesn’t one think? Don’t answer……it’s a rhetorical (trick) question. Enough of that foolishness…..for now. The new tow vehicle does indeed require a special hitch in order to haul the new camper we are due to fetch very shortly. I decided to go with a model from the PullRite Corporation. Yep…..it’s as big as it looks! It’s an auto-sliding hitch which should handle the new rig just fine. Since our truck has a standard (6 ½ foot) bed this style hitch is desirable as it automatically slides the attachment point aft in order to keep the nose-cap of the camper and the cab of the truck from making contact during extreme turning maneuvers. Soon the big day arrived. While traveling to the dealer with our old camper in tow, we noticed a fellow RV’r on the road directly in front of us. 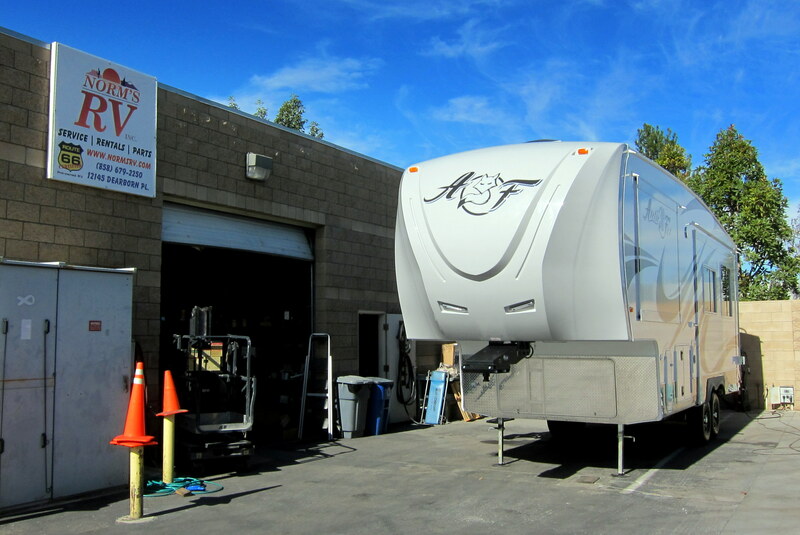 Even though his rig is considerably smaller than ours it does feature a washer and dryer strategically located on the roof. 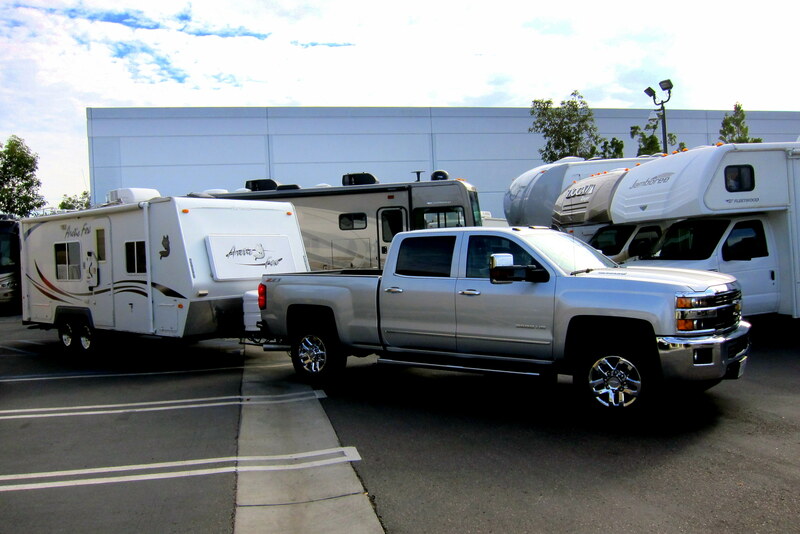 As we pulled into Norm’s RV in Poway, California it marked the final time we would be towing our trusty old friend…..a bittersweet moment for sure. However, excitement was swelling as we viewed the brand new replacement rig for the very first time. So, why did we pick this particular brand and model? Well, after more than 40 years of RV ownership Kit and I had a pretty good idea of what we liked. 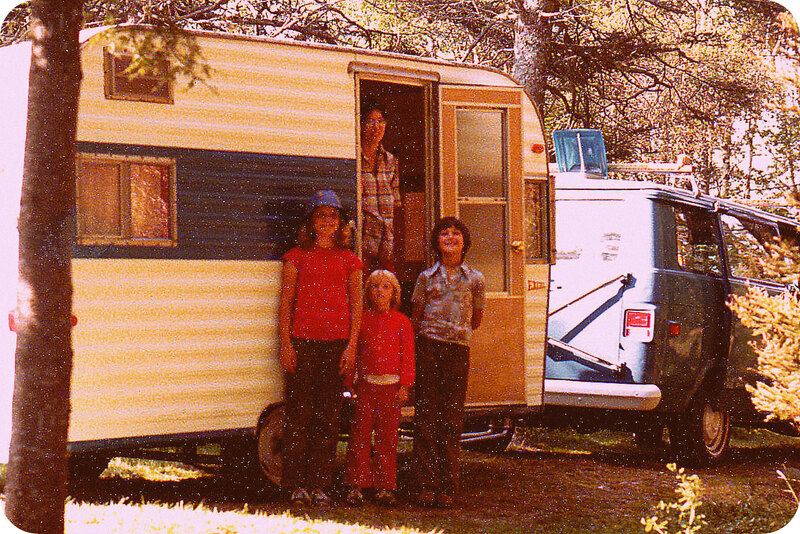 Of course, our needs had morphed over the years…..we picked up our first camper, ironically here in San Diego, back in the year 1975. 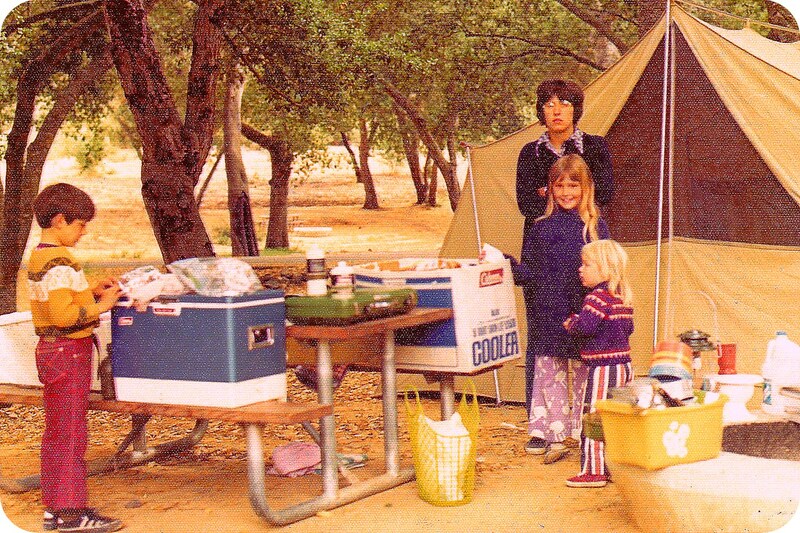 It was a 1967 Excel travel trailer and at fifteen feet a major upgrade from out tenting days. However touring about the country with three kids and no refrigerator or bathroom onboard is vastly different than what two retirees traveling today desire. This is our fifth camper in forty years of RV’ing and likely our last. At some point I intend to chronical our earlier touring adventures and the camping trailers that made it all possible. Yep, even back then, Kit kept meticulous records of those many trips and Kimber, Joe and Suzie have vivid memories as well. Recreating the adventures with accompanying historic photos is very doable! We stayed with the Arctic Fox brand because our previous one had delivered such great service and the company makes a fantastic product…..they’re not fancy but they are very well built! Kit and I decided to go the fifth wheel route due to the legendary ease of towing and the desire for more room with little additional overall size. Our previous truck and 22 foot trailer had a combined length of 44 feet, 6 inches while the new truck and trailer’s length is 45 feet, 2 inches. This eight inches of additional bumper-to-bumper length enlarged the living area by 53 square feet! 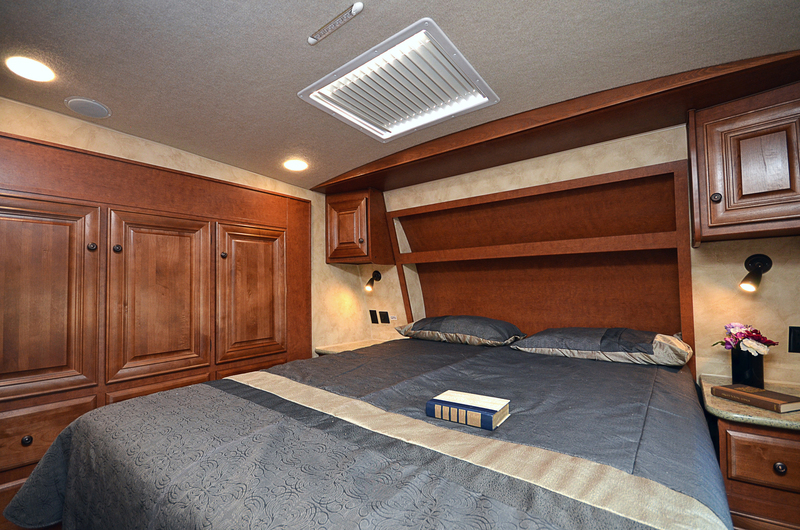 The increase in volume was primarily due to the fifth wheel configuration and the two slide-outs. 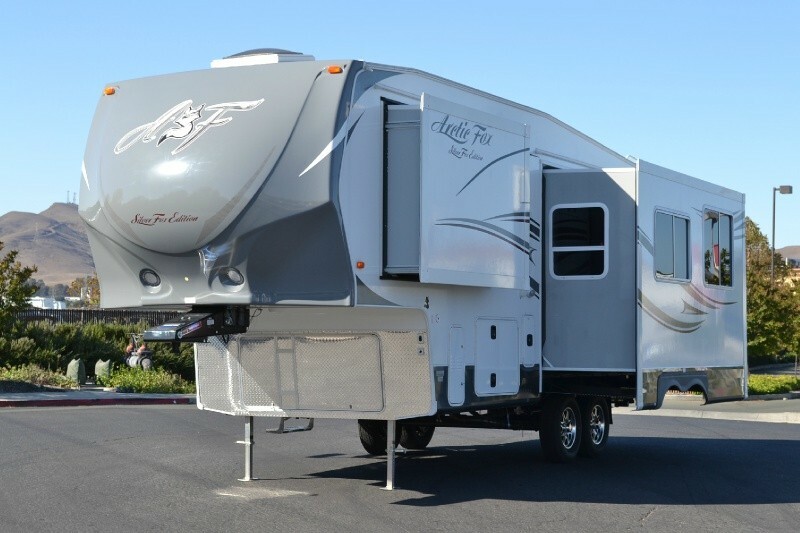 So with the relatively compact size, the ease of hitching and towing, and the extra storage inherent in the design, our choice is near perfect for us and our style of travel. Of course, with most decisions there are a few compromises. 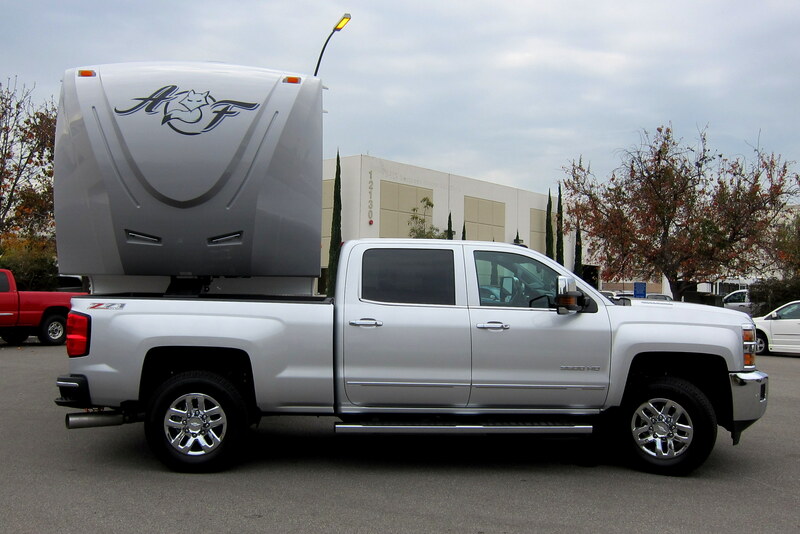 The major one going from a traditional travel trailer to one pulled from a fifth wheel hitch is the inability to affix a shell over the truck bed. This corresponds to the loss of roof racks to carry a kayak…..an issue that I’m attempting to resolve. 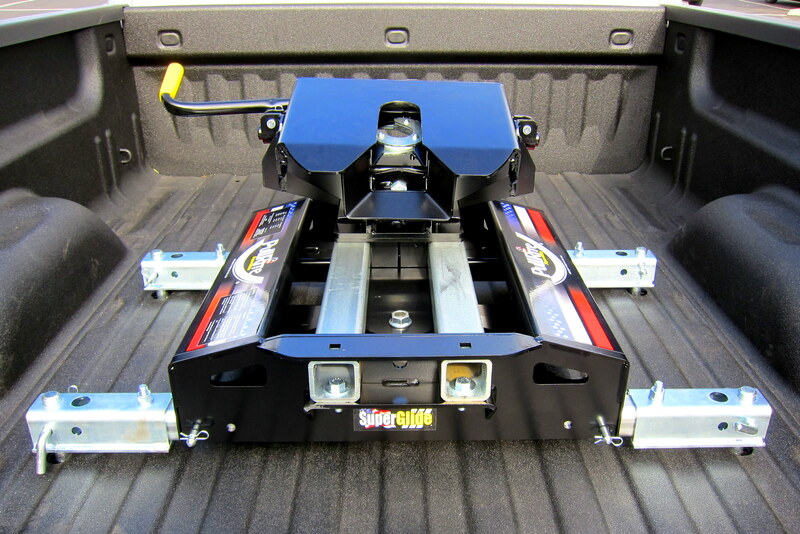 Also the hitch system reduces what can be carried in the truck bed. Life is certainly about choice, and choices have consequences. After a walkthrough and the servicing of a few minor discrepancies, the dealer demonstrated the hitching and unhitching procedure followed by a road test. Upon returning to the sales lot I pulled some extreme steering maneuvers to verify turning clearances were adequate. You can see in the photo above that without the sliding hitch moving the attachment point back fourteen inches, there would have been major damage to the truck and/or trailer! Comfortable that everything checked out, the dealership then positioned old and new trailer side by side in order to facilitate transferring all our junk. What a lot of room we have in the new unit…..however we will surely find a way to fill it up! 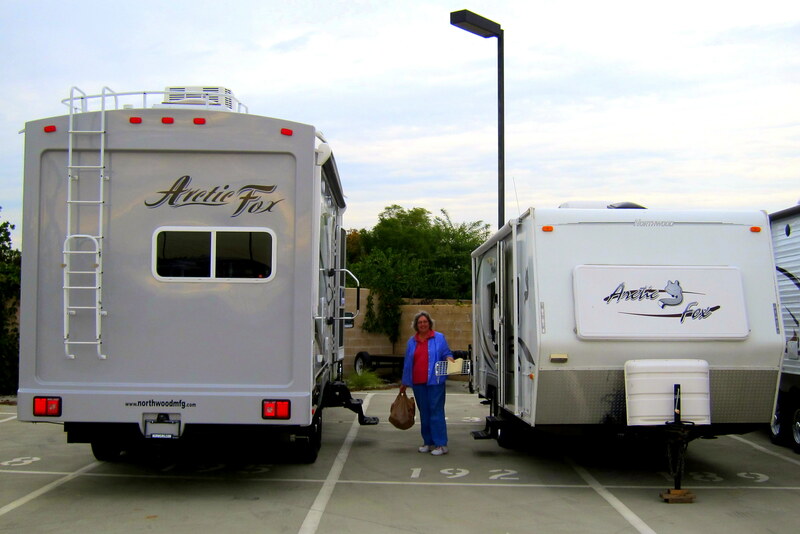 After a long and tiring day, Kit and I were ready to move the new camper back to our spot at Santee Lakes. This final photo about sums it all up. 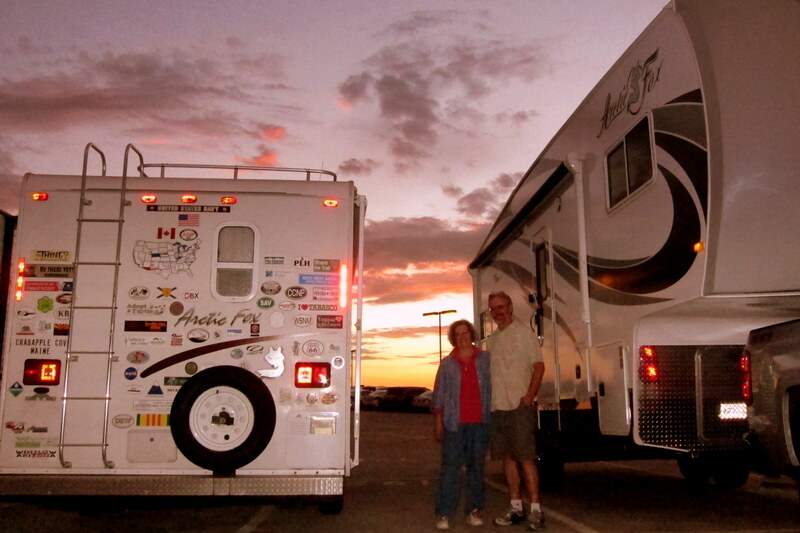 And now a word from Kit: A milestone moment, for sure, when we took possession of this Fifth Wheel! This is most certainly, our last trailer purchase. After 2.5 years of “research” (many of you folks know how Bill just LOVES to research things), we finally settled on this unit. Certainly, it’s not the most luxurious or largest; however, it suits us to a “T”! The one thing I missed in our last trailer was a comfortable chair to sit in and now I have one! Actually, we both have recliners, which is nice since we can sit side by side and actually watch the news on TV! Indeed, we are coming perilously close to the mainstream RV’rs! Have no fear though; we will still be staying in National and State parks along with the occasional truck stop. The new unit is so much more comfortable, with a much larger living area. We are still in the process of arranging things to suit our needs. With all this extra space, we need to be methodical about filling it up; correctly! PS Now, you can find some new toy to start researching! Wow! The new trailer is a beauty! Glad that you’re enjoying the trailer, truck & traveling. Wow wow wow. ….I could comfortably live in that guys…… Very very nice, you so deserve it. Kathy…I love the recliner!!! Nice rig! 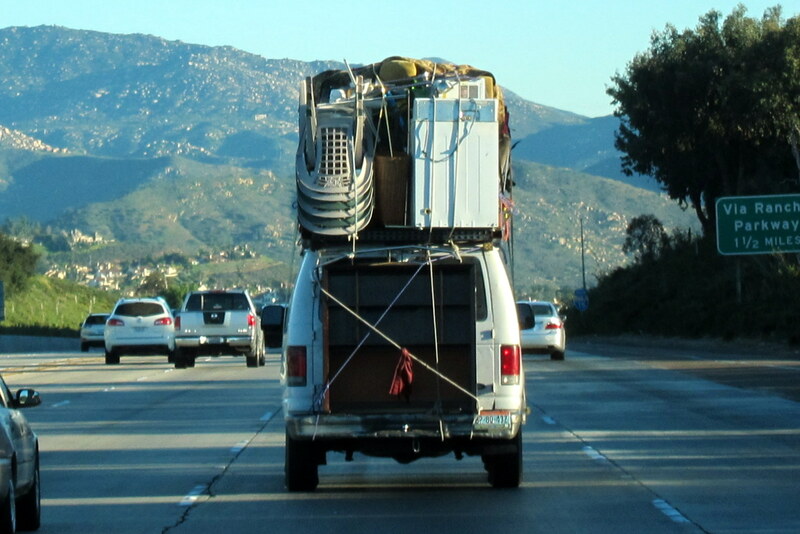 Now, you can travel in style, like Ray & Darlene. Your new Arctic Fox is quite a beauty on the exterior and even better interior design! You must feel as though you’ve fallen into a bed of clover. I love the photo of the HD TV mounted in front of Kathy’s desired recliners and what appears to be a big kitchen space – decadent! As Kit is sure to enjoy working in her new kitchen, you might get some delectable dishes coming out from that new kitchen! 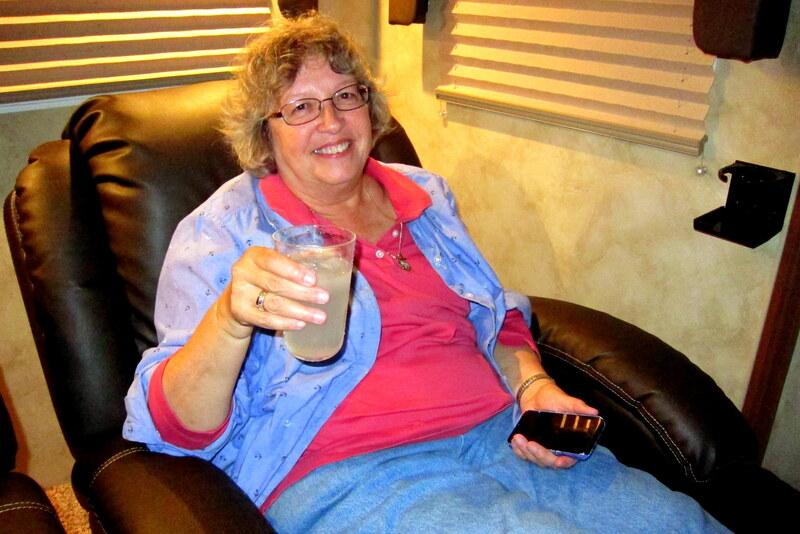 I raise a glass to you as well, Kit, sitting in your new chair, beverage in hand! The PullRite hitch looks impressive and will certainly lend a hand to keeping you safe on the road. I look forward to hearing about your adventures tooling around in your new digs! WOW!! TWIN GRAY WATER TANKS!!! TOYS?? RESEARCH?? COME ON NOW WIL. SHE GOT THE RECLINA,, ENOUGH ALREADY!! WOW! Sure looks supah!!! Happy 50th guys! Happy trails. Congratulations on the new Rig-it is beautiful!!! Kit looks very comfortable in her new recliner!! Happy 50th to you both. 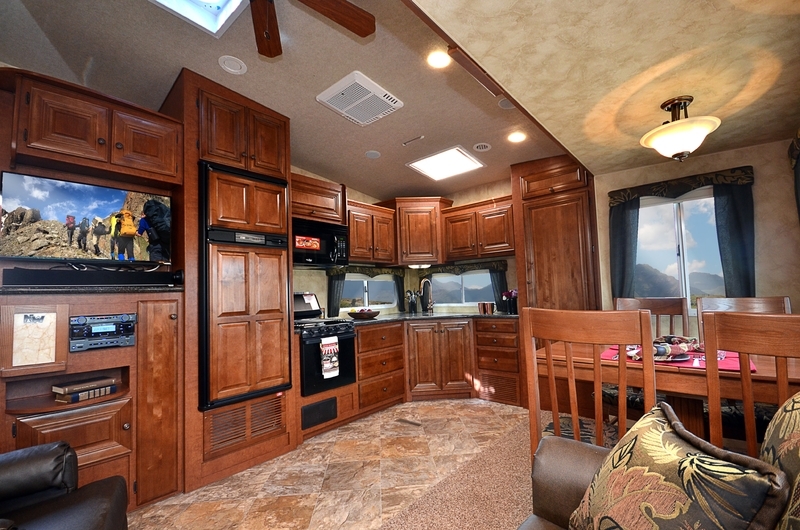 Safe travels in the Fifth Wheel and have many fun experiences. We love reading about all your trips. We hope to see you in Maine when you get back. You haven’t MISSED a thing this winter! SNOW, more SNOW, and still more coming! We are hoping to get to SC for March and part of April at the Air Force Famcamp at Charleston base-friends of ours have offered us their motorhome for a break from the horrible winter-we are looking forward to it!! Your new trailer is absolutely gorgeous. Not surprised you stayed with Artic Fox. They ARE well built. Continue to enjoy reading about your travels. Now THAT’S a home away from home- way to go!!! Meanwhile I’m stuck in snowbound Boston since my flight to LAX was cancelled yesterday!!@#@#????!!!!!!! I have to wait ’til Sat to fly out now, but happily had scheduled 2 1/2 weeks for vacation, so not missing too much… At least I am doing some time behind an Ariens at friends here-which of course I’m expert at handling now, thanks to you Bill! (bet you’re not missing THAT detail) I still enjoy it a great deal, probably because I’m not a homeowner! Wow! Love it!!! Is your road trip over already????? Hope to see you again soon! WOW is right. I have the feeling you may never come home now! Just remember we’re the state in the upper right corner! Love the rig. Looks like a real door to the bedroom too! You will both love the comfort and I am sure you will have many years of travel ahead with this new one! Love all your adventures. I am looking forward to when I retire to do the same, though we are looking to downsize from our 5th to a trailer with slides. We’ll see and maybe one day meet you on the road! It is beautiful inside and out. Happy Trails to you both! You both always tell such great stories… and now that we have seen the brochures, read the stories, we just have to see it for real in the Spring. Gorgeous! !